In the world of diets and cheat days, I'm here to tell you there's no "good" or "bad" foods. When we apply this black and white thinking to food, we can easily infuse a lot of guilt and shame into our eating. We create this pendulum swing back and forth between restriction and binging. Say, you decide to quit sugar because everyone on Instagram is doing it, yet you've always had a sweet tooth. You go for it and are feeling great for a week or two and are praising this lifestyle or proclaiming the evils of sugar. Yet, a week later, you go to a birthday party and turn down your favorite cupcakes. After that, all you can think about is the cupcakes and how good they are while also feeling conflicted and worried about what "could" happen if you eat it. A few days later, you go out and binge on cupcakes, feel terrible physically and mentally, then decide to get back on the "quitting sugar" bandwagon the next morning. It's the swing back and forth between physically restricting, then binging. When you quit these foods, it's easy to think that you will lose weight, improve your health, or even feel like you're making the better choice. Yet, what really happens is feeling deprived when you're not eating it, then feeling guilty or worried when you do it. Maybe you're not physically restricting or binging on foods, yet you're still beating yourself up about eating certain foods. You may be restricting yourself mentally, and that can feel just as terrible in your mind. Yet, there is a balanced point in between. When you're not on the cycle back and forth between restriction and binging, there's nothing to fight against. It's no longer a war. There's no plan or diet to "cheat" on. Food is not the enemy. You don't have to cheat, feel guilty, or deprive yourself of anything. You can enjoy food to nourish your mind and body. Be aware of your own patterns. Notice what rules you create around food in your mind - do you restrict certain foods or food groups out of fear of weight gain or other reasons? Recognize what happens when you deprive yourself - how does it feel physically, mentally, emotionally? Are you more likely to binge on it down the road? How do you feel when you eat that food? Remind yourself that food isn't "good" or "bad." All foods have a purpose. At its core, food is fuel for the body - both ice cream, kale, and oreos have calories and can provide energy for the body. While some foods are going to have more of a nutritional purpose, others will have allow you to enjoy delicious flavors or purely for comfort. Find a balance between all of these - eat whole foods that taste good and nourish your body while also savoring and enjoying foods that may be purely for taste. Eat what you want. In Intuitive Eating, this is related to the principle of "Make Peace with Food." It's all about giving yourself unconditional permission to eat what you want - yes, anything you want. Start to break those food rules you have to work through your fears associated with the foods. You may be worried that you'll feel out of control if you let yourself have whatever. Honestly, at first, you may eat more of the food you're restricting, but trust that over time, it will balance out. You can remind yourself that you can have the food anytime you like, then eat it mindfully to notice what you like or don't like about the food. This works. It's worked for me personally and professionally with clients. You're no longer in a guilt cycle with food. Often with these "bad" foods, many people start eating them and binge on them mindlessly because they realize "I'm so 'bad' for eating this. I better eat it fast and hide the evidence, so I can be 'good' again tomorrow." When you're eating in this style, you don't even taste or enjoy it - the whole eating experience is filled with guilt. Instead, give yourself permission to eat whatever you want - you can eat, enjoy your food, and move on without guilt. You're giving yourself permission. You don't anything to rebel against because there are no deprivations. Often, the cravings reduce over time because you truly realize you can have that food anytime you want. You can listen to how food FEELS in your body. You may notice what foods energize or deplete your body. 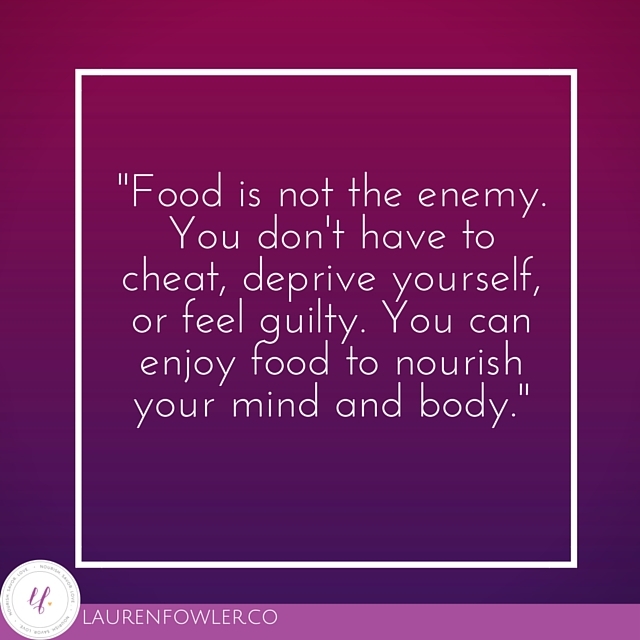 When you're no longer consumed by guilt or weight-worried food thoughts, you can actually listen to your own body to find a balanced approach with food. You can start to distinguish between your physical and emotional hunger. You have more energy and mental space to live your life. When you're no longer trapped in a mental cycle of worrying about what or when you can eat or googling what foods to avoid next, you can eat to nourish yourself and savor food, then move on. Food and nutrition are amazing, but there's more to life than food. Explore different hobbies or activities, spend time with people you love, and get out to live your life! For me, this is how I truly live my life, and I want others to find unconditional permission with food as well. You're allowed to eat whatever you want. You're allowed to enjoy food. You're not "good" if you eat certain foods and you're not "bad" if you eat other foods. You can trust and listen to your body.